The Old Tramhouse four star-(newly upgraded JANUARY 2014). 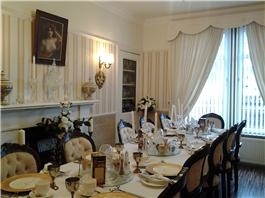 Close to Stirling University, The Wallace Monument, Stirling Castle and all other main attractions. 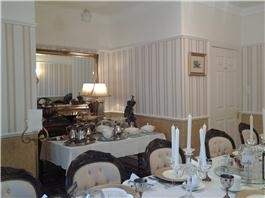 Also near local restuarants and bars and close to Stirling's great shopping area and great restaurants and bars. 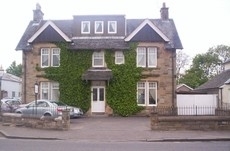 Close to motorway links, 25 minutes from Edinburgh Airport and 40 from Glasgow - an ideal touring base. Also close to all local business parks and Prudential and Capita. Ideally located and on main bus route and near to the railway and motorway links. We are close to restaurants, William Wallace monument, Stirling University, and Stirling Castle, also close to local golf courses and main town centre of historic Stirling with easy access to the Safari Park and Sterling Mill's Designer Outlet Village. An ideal touring base for Central Scotland. Prudential , Capita free buses to offices route along causewayhead road..
All rooms are ensuite with flat screen freeview dvd tv's, tea and coffee making facilities in each room, FREE HIGH SPEED WiFi, welcome tray, hairdryers and use of iron. Luggage rack in every room.. Excellent choice breakfast menu to choose from . Selection of starters from the buffet starter table. 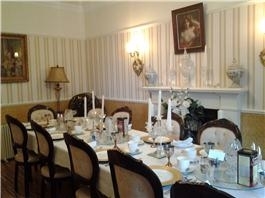 The excellent choice from main breakfast menu served in our traditional dining room. Fine china , crystle, and silver goblets to help make your breakfast feel abit special. LONG AND SHORT STAYS WELCOME. Tel. UK 01786 449774 .